A prosecution witness, Abdul-Rasheed Bawa, an investigator with the EFCC, on Monday, November 27, 2017, told Justice Hakeem Oshodi of the Lagos State High Court, how the Managing director of Eternal Oil and two others forged 30 Documents to defraud the federal government in fuel subsidy. 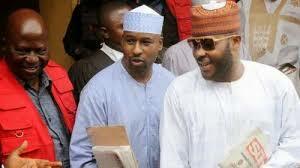 The trio of Mahmud Tukur, Abdullahi Alao and Ochonoghor Alex and their companies Eternal Plc and Axenergy are being prosecuted by the EFCC for defrauding the government to the tune of N3,121,393,098 ( Three Billion, One Hundred and Twenty- one Million, Three Hundred and Ninety- three Thousand, Ninety- eight Naira). The defendants had previously been arraigned before Justice Lawal Akapo on December 10, 2015, for allegedly diverting the money obtained from the Federal Government for the purpose of importing Premium Motor Spirit, PMS. Counsels to the accused had subsequently filed a joint application seeking to quash the charge preferred against their clients by the Commission. The defence counsels had argued that the State High Court lacked jurisdiction to entertain the matter on the grounds that the allegations against them were oil and gas related, which could only be heard by a Federal High Court. The accused, through their counsels, had also argued that the prosecution could not establish a prima facie case against them. In his ruling on the application, Justice Oshodi had dismissed the application and upheld the argument of the prosecution. The Judge also held that the prosecution had successfully established a prima facie case against the accused persons and described the application as “premature”. At the resumed hearing before Justice Oshodi on Friday, November 24, 2017, the defence, again, argued that the prosecution did not have the fiat of the Attorney General of the Federation, AGF, and Minister of Justice, Abubakar Malami, SAN, to prosecute the case. In his response, the prosecution counsel, Rotimi Jacobs, SAN, however, submitted that he did not have to show the defence the fiat of the AGF to prosecute them. Jacobs further submitted that he could only show his client, the EFCC and the court the fiat and not the defence counsels. Justice Oshodi upheld the argument of the prosecution counsel, thereby setting the stage for the prosecution witness, Bawa, to give his evidence against the accused. The accused, among others, claimed that they had imported and discharged PMS sometime in September, 2011 at a tank farm in Lagos, First Deep Water Discovery Limited, for which they were paid the sum of N626m subsidy. Also, the accused said they received the sum of N595m from the government after claiming to have imported and discharged PMS at the same tank farm in Lagos sometime in October 2011. However, the witness, in his testimony, told the court how the accused, without any fuel importation, forged over 30 documents and submitted same to the Petroleum Products Pricing Regulatory Agency, PPPRA, to fraudulently obtain the subsidy for the importation of PMS in 2011. Led in evidence by the prosecution counsel, the witness said: “The owner of the vessel, MT Deepwater EX MT Valle Di Castiglia, and the claimed tank farm of discharge, First Deep Water Discovery Limited, denied the usage of their vessel for the transaction and also confirmed forgery of documents submitted by Eternal to PPPRA. Giving further evidence on both MT Fulmar Ex MT Emirates Star and MT Panther EX MT Emirates Star, the witness said the modus operandi employed by the defendants to defraud the government was alteration of bills of loading dates resulting in higher costs of importation. He said: “The claimed MT Emirates has a bill of lading dated 28 April 2011 which gave Eternal a loading cost of about N151. “However, an investigation revealed that the actual mother vessel for the transaction is MT GonHild Kirk, which had a bill of loading with the date of April 3, 2011, with landing cost of about N141. He added that search on LLyods Intelligence on Emirates Star indicated that the vessel sailed out of Doven Strait, United Kingdom and arrived New York, USA within the period that the Eternal documents claimed that the vessel was discharging its products into MT Fuliman and MT Panthern. The case was adjourned to February 26, 2018, for continuation of trial.